The problem with baseball’s unwritten rules is that no one has bothered to write them down. If someone had, Jim Palmer certainly would’ve offered a more accurate prediction when Gary Thorne inquired during Tuesday night’s game as to whether the Yankees would retaliate for Daniel Cabrera hitting Derek Jeter with a pitch during a 10-0 ballgame. Shortly after Palmer explained that it would be ridiculous for the Yankees to bean an O’s player in response to Cabrera’s errant pitch, LaTroy Hawkins started tossing balls at Luke Scott’s head. If anyone should know the proper conduct on the mound it would be Palmer, which underscores the subjective nature of that ridiculous concept known as baseball etiquette. There are many examples that demonstrate this subjectivity. -A-Rod yelling “I got it” on the base paths last season to distract Howie Kendrick violated baseball etiquette. That is, unless you asked Tommy Lasorda, who defended Rodriguez’s distraction in the press as an effort to gain a competitive edge. -Ben Davis breaking up Curt Schilling’s perfect game in 2001 with an 8th inning bunt was a clear violation of baseball tradition, so much so that Diamondbacks Manager Bob Brenly referred to the move after the game by using a compound word synonymous with poultry excrement. But, as this Ron Cook column shows, some viewed Davis’s late-inning bunt as a shrewd effort to manufacture runs in a tight, 2-0 ballgame. Ultimately, what bothers me most about baseball etiquette is that the judgments rendered about potential violations are often made relative to the player involved. Baseball justice is not blind. Consider bean-ball-throwing, bat-tossing Roger Clemens. 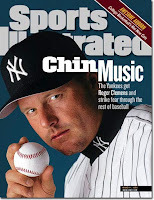 Celebrated during his playing career for his toughness, defined in part by his willingness to drill batters for even the most minor of perceived infractions, Clemens appeared in a Sports Illustrated cover story titled “Chin Music” that ran during the spring of 1999. Several months earlier, in the fall of 1988, the magazine took a decidedly different tact in its treatment of Armando Benitez. SI joined in the vilification of Armando Benitez for hitting Tino Martinez between the numbers and touching off an ugly brawl at Yankee Stadium. Granted, Benitez shouldn’t have thrown so high, but Clemens was equally as dangerous with his actions over the course of his career. I suppose “Lastings Being Lastings” doesn’t have the same ring to it. Great points, especially about Milledge. That incident got him such a bad name but to me it was at worst overexuberant celebration. If that’s the worst you can say about a guy…The best I can figure is that pitching inside or “up and in” is fine but throwing at (or nearly behind) Scott’s head is the crossing the line.But that’s just me. And Ken Singleton.